It’s not easy being a Christian. Sometimes, we too easily forget this important truth. Indeed, Jesus himself warns while also inviting us: “If anyone would come after me, he must deny himself and take up his cross and follow me” (Matthew 16:24). Following Jesus involves not only the cross of salvation, but a cross of suffering. The early church fathers understood the cross of suffering well. For example, consider Blandina of Lyon. Blandina was a lowly slave, thrown into prison during the reign of Marcus Aurelius. When she was finally brought forth from her cell to be tortured, her companions pleaded for leniency, worried that her fragile body would not be able to endure brute beatings. The official presiding over Blandina, however, demanded that the executioners torture her in the most heinous manner possible. Church lore has it that, even though the executioners brought their worst tortures against this frail lady, they could not kill her or even bring her down as she repeated over and over, “I am a Christian, and we commit no wrongdoing.” Being unable to kill her, she was finally scourged, placed on a red-hot grate, enclosed in a net, thrown before a wild steer who tossed her into the air with his horns, and at last killed with a dagger. Such was the gory martyrdom which this faithful woman endured. As I mentioned in ABC, the Greek word for “competes” is agonizomai, from which we get our English word “agony.” Thus, competing in the game of life is not always easy. Sometimes, it can involve agony, pain, and persecution. This is why the apostle Paul writes of his ministry: “We proclaim Christ admonishing and teaching everyone with all wisdom, so that we may present everyone perfect in Christ. To this end I labor, struggling” (Colossians 1:28-29). The Greek word for “struggling” is agonizomai. Paul freely admits that preaching the gospel and contending for the faith can sometimes be agonizing. But Paul continues: To this end I labor, struggling with all his energy, which so powerfully works in me” (Colossians 1:29). Paul’s ministry may involve agonizomai, but he does not have to face agonizomai alone. No, Christ’s strength powerfully works in him and endures it with him. After all, Christ endured the worst agonizomai of all – the agonizomai of the cross. Thus, he can surely help us as we face the agonizomais of life. Are you suffering? Are you being persecuted? Are you hurting? Christ gives his energy to help us face the agonizomais of this world and of our lives. He gives us strength for today and a crown for eternity. 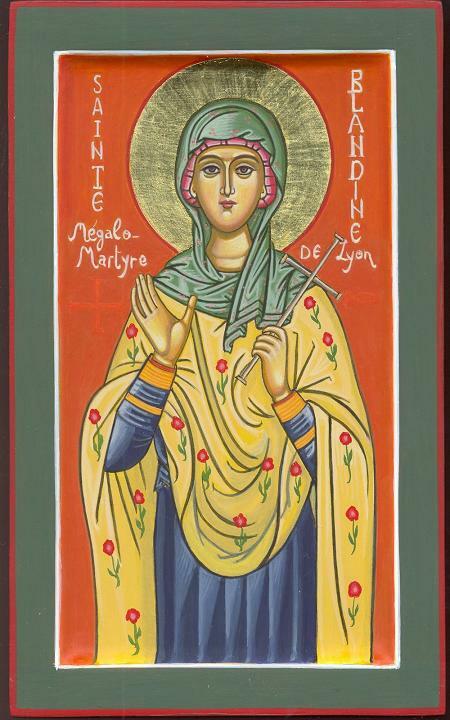 And as Blandina and all the martyrs would most certainly tell us, the agonizomais of this life cannot even begin to compare with the crowns of glory which await us (cf. Romans 8:18). So stand strong! Entry filed under: ABC Extra. Tags: 1 Corinthians 9:24-27, Agony, Blandina, Crown, Martyr, Suffering.